After seeing a relatively sharp decline of 6.3% in Q4 2017, sales in the first quarter of 2018 have bounced back, marginally improving over 2017’s numbers, according to a new report by Gartner. Specifically, Q1 2018 saw year on year growth of 1.3%, with total smartphone shipments reaching 383.5 million units. Leading the pack, as usual, was Samsung, with total shipments of 78.56 million, a small decline of 0.21 million when compared to Q1 2017. Ultimately, though, considering the overall growth of the segment, Samsung’s market share dropped 0.3% to 20.5%. The South Korean giant’s decline is attributed to increased competition in the mid-tier market. Furthermore, it’s noted that demand for flagship smartphones continued to drop throughout the three-month period, something that would fall in line with the weaker Galaxy S9 sales that have previously been reported. However, rival Apple once again managed to buck the trend throughout the quarter, with its shipments growing just under 3 million to 54 million. In terms of big winners throughout the period, Huawei and Xiaomi saw the biggest increase in shipments. Huawei’s increased presence in global markets led to a growth of over 6 million units to a total of 40.4 million units, while Xiaomi’s aggressive pricing and an increase in demand for low-cost smartphones allowed it to more than double its shipments, adding an extra 16 million units during the period. This equated to a total of 28 million and 7.4% market share. 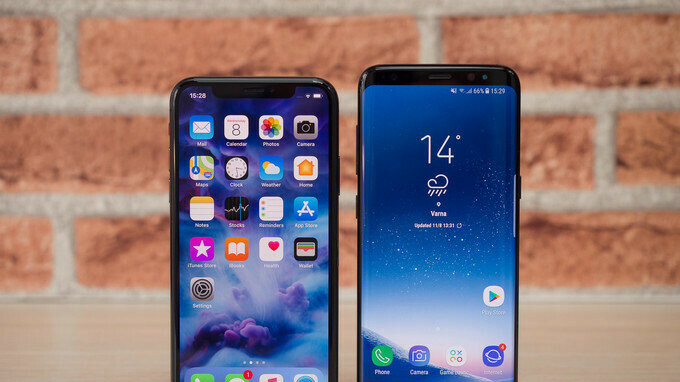 Overall, smartphone shipments are expected to continue experiencing minimal growth going forward but considering the increased competition and the inability to grow in major markets such as China, Samsung’s lead over global manufacturers could continue to shrink as brands such as Huawei and Xiaomi utilize more aggressive strategies. What Samsung has to do right now is STOP copying others and embrace something new for a change, like a new software strategy (UI overhaul, modern looking Apps etc) or a new hardware strategy like new Cameras something like that. They say they pour billions in to R & D but where are the results?? They can go for an entire new design too for their flagships. But sadly they don't do any of this stuff, they just incrementally copy others and just keep on swinging hoping they'd hit somebody......lol Look at Huawei, they have some awesome hardware + software and all that came very recently too. Why can't Samsung do something different and innovative? What you are describing won't help Samsung one bit. You are making the same argument some have made forever about Apple. Just about every analysts said Apple needed to drop their prices back in 2012/13. Apple did no such thing and look at them 5/6 years later, not much has change. All the Chinese vendors are beating Samsung on price, that's it. They are offering the same products at a better value. There is no magic to anything Huawei and the rest of the Chinese oem's are doing. They are all using the same commoditized OS (Android) and hardware. The only thing they can differentiate on is price, UI's makes very little difference to the average users. Only folks on forums seems to care about that and they are in the minority last time I checked. To me Samsung can't seem to make up its mind on what it wants to be and they are losing on all front as a result. I also agree that Samsung can only compete on price level right now because also the hardware development has become predictable. Every OEM knows what the next developments are on hardware side (in-screen fingerprint sensor, larger camera sensors...) because they all are buying from the same suppliers. If Samsung wants to differentiate, they need to develop exclusive hardware like Apple does. However, this is difficult because Samsung is not selling enough premium flagship phones to justify the investment. I agree with you that Samsung needs to decide what kind of OEM it wants to be. I recommend to focus on the premium side of the market and leave the low and mid end range behind. On the contrary, it's the other way around. the Mid & poor income demographics are growing exponentially which makes them the better market to target if they had to choose between them but i think they need to maintain what they are doing focusing on both premium and mid range markets with more focus on the mid range market. Samsung needs to offer more great value for money devices and market them like crazy in growing young demographic economies like India,Pakistan,Nigeria and the rest of Africa and Middle east. China is no more possible for foreign brands to grow in because of the fierce competition from local brands that's why most of the foreign brands are getting out of it or lowering their operations there. What you need to do is, REALIZE THEY ALL COPY so don't make it sound like only Samsung copies. When will you learn that when they ALL copy it only benefits us to have more in what ever brand we like the most. You try to hard go look at your Samsung phone before the original iPhone was released and then look at them after. Samsung wouldn’t of been where it is now if it weren’t for apple and that’s why they lost the lawsuit. You're not trying hard enough. There is a possibility that my Samsung phone was the F600, announced at nearly the same time as the iphone . I did have the LG Prada, Apple wouldn't have been where it is without it winning the iF Design award 6 months before the iphone was announced. Samsung can't drop the prices, that's the thing and why they will eventually lose the market for Apple and those Chinese companies. Well Samsung is in a tough spot for sure. Unlike Apple, they are just a hardware oem with no OS service business. Apple makes money all over the place, they make money when they sell you a device, they also make money when you buy apps, and they finish it up with Apple Care and now they've added subscription services. It's why they are so profitable, Samsung only makes money when they sell you a device, not after and never mind a subscription service, they tried that and failed. In which case Samsung is no better than all the rest of the android oem's. The one thing Samsung had over all the rest of the Android oem's was scale, but that is slowly going away because mobile tech have mature and very little if anything nowadays are new breakthrough techs. Now, Samsung will have to compete on price and that is where they are losing to the new Chinese new comers. They are so focus on Apple they can't see where the real threat is coming from. Apple is the least of their problems. Same can be said to Google and Microsoft, Apple's business model makes them a very predictable competitor. A competitor that seems to focus on the higher end of any market, which means there is a whole 80% plus of the market that's available for the taking, but everyone seems envious of Apple's revenue and profits. We’re talking about losing market share. Obviously Samsung as a whole is fine. losing market share? They only sold 200,000 less units, hardly disastrous when you are selling almost 80 million units per quarter. So, we're talking about market share based on my reply to a comment that says ," Apple makes money all over the place", "they are so profitable", "Samsung only makes money when they sell you a device". You should try harder at reading and then you may start knowing what you're talking about. People are also going to get smart one day and stop paying so much for the iphones too. Why do you think the rumors are going around that apple will drop prices. Because they know those Chinese companies are getting closer every year. People will always going to buy iPhone, they buy it for ecosystem and OS. We pay the price to get iOS experience. It doesn't matter If the chinese companies getting closer If Apple still collecting all the money in the market. Those Android companies can fight for the leftovers, in the end Samsung is the one who going to lose. Then why is there talk apple will lower prices. Only one reason, the cheaper OEMs are getting closer and even apple is losing customers to them. Apple userbase is growing, not getting smaller. Also what talk there's been about Apple lowering iPhone prices? I only heard that upcoming X might be cheaper, it makes sense because part used in X are now cheaper. Don't forget that S9 released mid-march and only have 2 weeks of sales in Q1 report. Well in Q1 the iPhone X had 3.6% of worldwide sales. In Q1 Samsungs S9 and S9+ had combined 3.2% of sales with only 2 weeks of the quarter on the market. Thats actually pretty good numbers for only 2 weeks. Pre orders were up from March 1st. So technically people had the chance of buying that since March 1st.